Shake It! And Take It! Zurvita Protein, like other Zurvita products, is made with the same commitment – use only the most nutrient-rich and highest quality ingredients. Our protein comes in two crowd-pleasing flavors, Vanilla Crème, and for chocolate lovers, Chocolate Delight. Not only are they delicious and nutritious; they are convenient and ideal for busy and active people-on-the-go! Add water or milk to a Protein Shake bottle for a snack or meal replacement anytime. You can also blend Zurvita Protein with other fruits and liquids to create your own smoothie. Because Zurvita Protein is a source of dietary fiber it can leave you feeling full and satisfied – and that kind of feeling can make it easier to say “yes” to healthier choices. Consult a physician before starting this or any supplementation. If you are pregnant or nursing, seek the advice of a healthcare professional before using this product. Not intended for children. 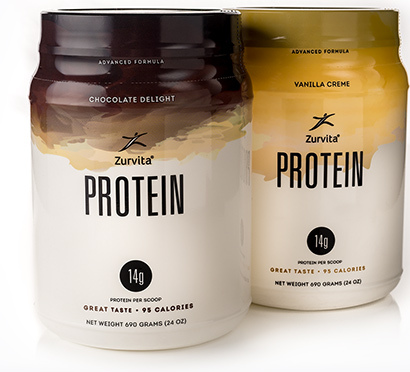 Zurvita's Protein products are currently available in selected markets.